Anna Kimberly with a baby goat, Ada Oklahoma, from Butterfield Farm of East Granby on Saturday at Norfield Grange's Winter Farmers Market. 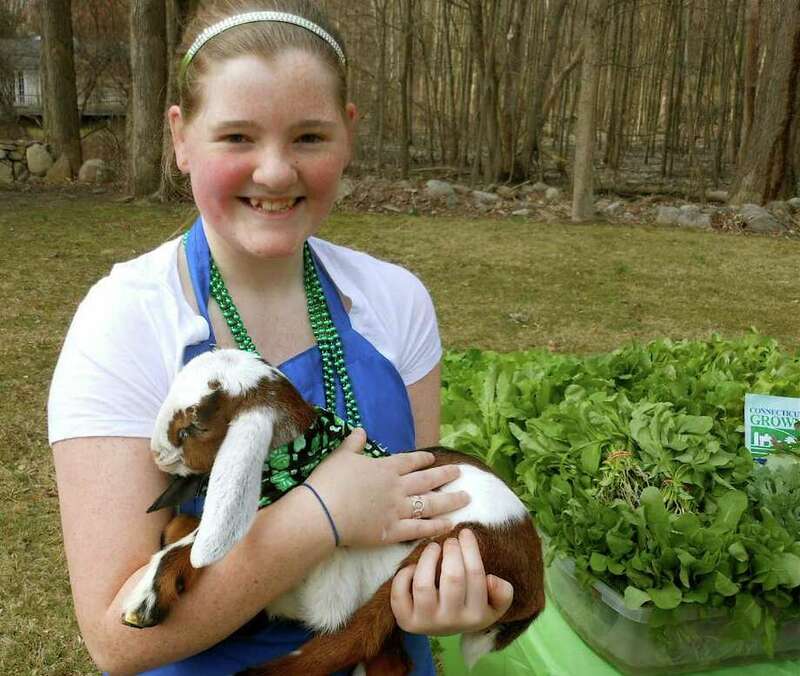 Norfield Grange rolled out the greens -- and a couple of goats -- as St. Patrick's Day features Saturday at the Weston Winter Farmer Market. Other fare included natural foods, apparel and other artisanal products. The weekly market, housed in the grange at 12 Good Hill Road in Weston, has been held every Saturday from 10 a.m. to 2 p.m. since November and will run through June 9. It's conducted annually rain, shine or snow and typically hosts 20 to 25 vendors -- farmers, specialty food producers, artisans and crafters. To enliven the market for the Irish holiday, Butterfield Farm Co. brought two young goats, Ada Oklahoma and Cabo, for children to pet and feed. "We're regular vendors here," said Butterfield Farm co-owner Tara Bryson, "and today we're just having some fun educating the community about goats. People get to meet the animals that produce the goods at the farm. We make all goat-milk-based products including cheese, yogurt and bath and body items. Goat milk products have been shown to have many health benefits." Butterfield's inventory is a good fit with other vendors' goods, said Lyn Kimberly, market master and a Norfield Grange officer. "Everything is handmade, homemade or homegrown." As the gray morning skies cleared and the day grew warmer, visitors wandered from table to table, set out on the grass and inside. Lilting Irish music played from a sound system and the aromas from bubbling soup, soda bread, seafood and garden greens mingled in the air making this "winter" market a true spring fling.